C.I.D. 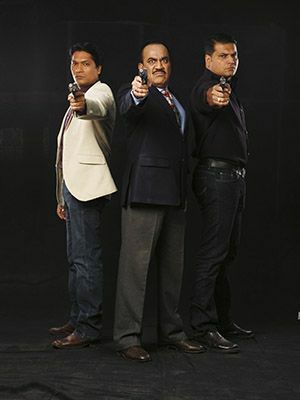 is the longest running show on Indian Television. It has been criticized for being male “skewed”, and allegedly, most of it’s core audience members are children. I don’t know what that says for the future detectives of India, but we will leave that issue for another day. 1) All criminals must be slapped upon apprehension. If it is a male criminal, the man detective slaps him; if it is a female criminal, the lady detective must do the slapping. 2) Bomb blasts will rip peoples bodies from limb to limb. But somehow, the watches will survive intact to transform into key pieces of evidence. On a separate note, I’d like to know where they buy them: those things are invincible! 3) While we are on the subject of watches – they are ALWAYS important. Apparently no two people own the same watch, and since we know they survive any type of calamity, it is always better to check the wrists of everyone around you. You never know which of those suspected killers you could nab using this surprising strategy. 4) Although this is not strictly related to crime solving: extras are not hired by crime shows – as evidenced by the fact that they do not appear fazed at all at the fact that a bomb just went off. They are busy staring at the camera and waving. Detective #1: (after checking pulse on corpse): This man has been murdered! Detective #2 (staring at said corpse): Really? He has been murdered? Also statements (also all translated) like (while in the roped off crime area): “this is where the bomb blast went off”, and upon grasping an obviously bloody watch “there is blood on this watch”, and upon finding the hidden briefcase in front of his colleagues “look! he hid a briefcase!” (yeah we were all there, we all saw it come out from under the pillow). 6) You can go up to anybody and say “I’m from the C.I.D.”, provide no identification whatsoever, and the person will readily spill their guts telling you all about the guests at their hotel or their friends or give you all of the photographs he just took. 8) True Mastermind criminals don’t bother to use gloves, they simply go to the washroom and rinse off. Nobody’s gonna ask about the red stains on your hand because you were too cheap to use soap buddy, it’ll be absolutely fine! I sincerely hope that this aids all budding detectives in their future pursuits! Good luck to you all. Omg Mira I actually laughed out loud – your commentary is hilarious!! I want to see this show!